Brands, broadcasters and content owners can now extend their existing online video channels and video content catalogs to LG Smart TVs at no extra cost, with Opera TV Snap, the breakthrough toolkit that generates Smart TV channels in minutes. LG Smart TV will launch selected channels from Opera TV’s portfolio in eight markets: the United Kingdom, France, Spain, Italy, Germany, USA, Mexico and Brazil. The first phase of the Opera TV launch will include up to 18 channels in each country, with thousands of videos ranging from movies and TV series, music, sports, news, lifestyle, and nature and travel. More channels will be added periodically, representing a significant opportunity for video content owners to reach LG’s vast audiences. Opera TV can be found in LG Smart World in the Entertainment category on both Netcast and WebOS device models that have been shipping since 2014. “With the fast-changing landscape of online video consumption and distribution, content owners are keen to reach viewers on all screens, especially the largest screen in the home. At Opera TV, we’ve designed innovative products that enable them achieve this goal. Our partnership with LG represents a significant milestone in our journey to enable exciting living room experiences for end consumers,” says Aneesh Rajaram, SVP at Opera Software. All content inside Opera TV on LG Smart TVs is built using Opera’s revolutionary toolkit, Opera TV Snap. With this toolkit, Opera’s content partners and broadcasters can convert their video assets easily into Smart TV channels, all in the cloud and in a matter of minutes. For broadcasters, it also offers expanded OTT capabilities, such as enabling the catch-up TV services (OTT VOD), multi-tier navigation for episodic video content, and various monetization options by displaying pre- & post-roll advertisements within the TV apps, using their existing or Opera Mediaworks’ advertising solution. 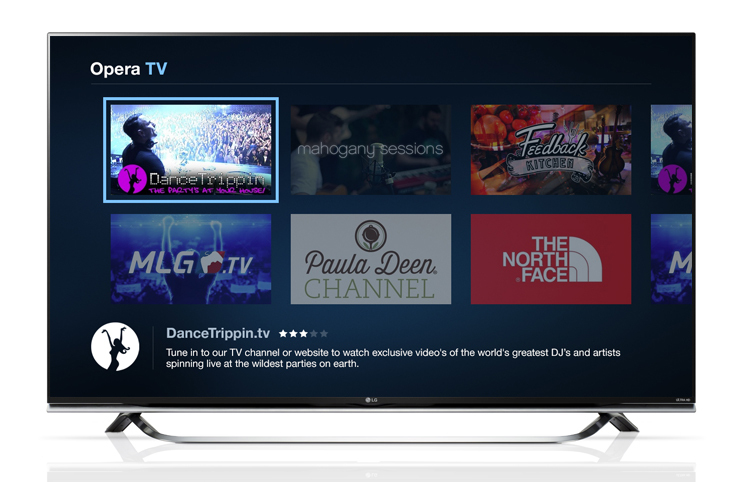 Hundreds of Smart TV apps have been generated from Opera TV Snap by brands, content providers and broadcasters including ArrivalTV, Dancetrippin, Epic TV, Fashion TV, The North Face®, Young Hollywood, Major League Gaming (MLG.tv), Mahogany Sessions, Outside Television, among others. Apps created with Opera TV Snap can be found on the following LG Smart TV Platforms: NetCast 4.0, NetCast 4.5, webOS 1.0 and webOS 2.0 in the United Kingdom, France, Spain, Italy, Germany, USA, Mexico and Brazil. Keen to reach new audiences and turn your video channel into a TV app in an instant? Click here to add the details for your video channel, which will be transformed into a TV app in under a minute and ready to submit for review. The Opera TV portfolio powers rich web experiences on tens of millions of Smart TVs, set-top boxes, Blu-ray Disc players and chipsets for more than 60 customers. The Opera TV ecosystem spans the Opera TV Store app platform with hundreds of entertaining apps tailor-made for TV, Opera Devices SDK (software development kit) for creating and rendering HTML5-based user interfaces, and the Opera TV browser for reaching the full web. Opera TV offers solutions for OEMs, pay-TV operators, broadcasters and content publishers. With the Opera Mediaworks advertising platform, Opera TV can help monetize and drive traffic to content through an end-to-end advertising solution. Visit www.opera.com/tv/ to learn more.